We've just added a second date for Peirce Night; a night that's all about you and achieving your goals. We understand it’s the middle of summer. It's your time to relax, and thinking about adding college to your already full plate is tough. At Peirce College, we believe that it might not be as tough as you think. Here are our top five reasons why there’s no better time to start earning your degree. 1. Transfer-friendly degree programs. When you’re an adult student returning to college, every credit you’ve already earned counts. Choose from our three bachelor’s degree completion programs in business, legal studies, and information technology. They’re programs that are especially designed to maximize the credits you already have and put you on an accelerated path to degree completion. Peirce also has transfer agreements with over twenty community colleges in the region to ensure their students a smooth transition and transfer of credits. 2. One on one wrap around support. At Peirce, you’re not just a number. That’s why we assign you a personal enrollment representative to walk you, start to finish, through the process of going back to school. They’ll coach you through registering for classes, buying textbooks, and be your cheerleader as you manage any back to school jitters. It’s their job to get you ready for class and keep you focused on your main goal; graduation. 3. Unmatched flexibility. Everyone knows that working adult learners need flexibility, but at Peirce, we know they also need something extra; innovation. That’s why we’re the first college in the nation to offer our entire curriculum in Peirce Fit™, a revolutionary learning format that lets you choose each week either to attend class in person or online. We’re also the only Philadelphia-based school to offer a competency-based bachelor's degree in Information Technology, putting IT professionals on the most direct path to earning their degree. 4. You can save money*. $150 to be exact! Don’t let a fear of finances keep you from investing in your future. 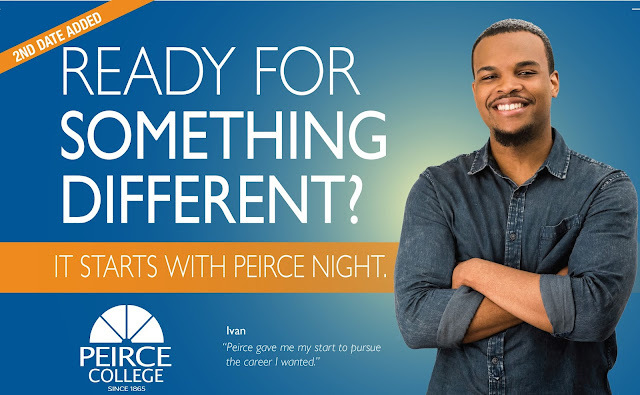 When you attend Peirce Night and register for Session 1 classes, we'll waive your $50 application fee and give you a $100 book voucher to put towards your textbooks. Plus, if you’re employed by one of our corporate partners, (or if your spouse or parent is an employee) you’ll also have access to a 25% tuition discount! 5. You can earn money. The facts are that people with a bachelor’s degree earn on average $500 more per week more than those that didn’t graduate from college. That’s $2,000 more a month, and $24,000 more a year. What’s more, the unemployment rate among workers with a bachelor’s degree is less than half the rate compared to workers that didn’t complete their college education. ** Don’t let procrastination get in the way of achieving your goals and living the lifestyle you want for you and your family. Are you ready to take the first step? Register for our upcoming Peirce Night today—it’s a great way to kick start the process of going back to college with exclusive giveaways and access to discounts. *$100 book voucher will be awarded to students who register for classes by the week of 9/6/16 for textbook purchases only.